Last Tuesday, a Texan animal rescue group found a pit bull and an orphaned kitten on a roadside. 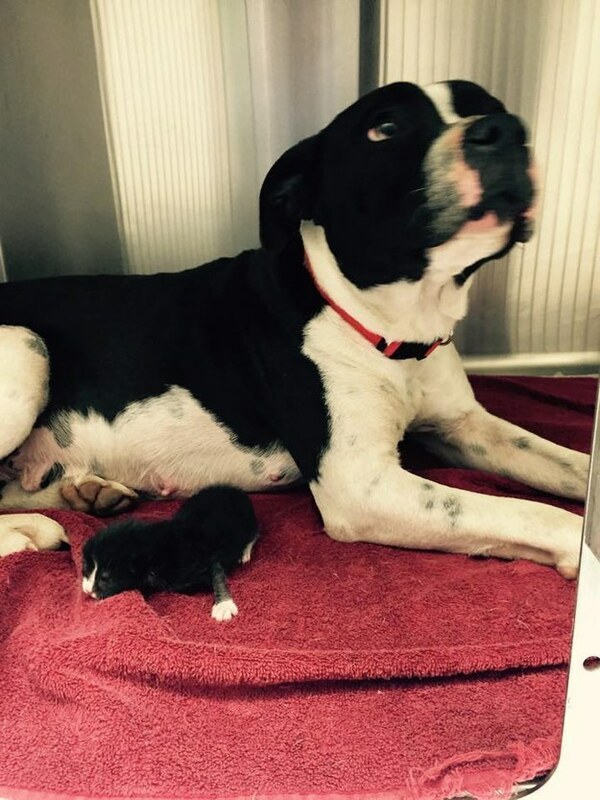 The pit bull, currently referred to as “Pittie,” had been keeping the newborn kitten alive with her own milk. They were taken to the Mercy Animal Clinic in Dallas where they are currently being cared for. While both Pittie and Kitty were in reasonably good health considering, Pittie’s milk was drying up and they took the kitten to bottle feed her. However, the adoptive mom insisted on watching over her kitten: cleaning her and refusing to leave her side as she ate. Because Pittie gets upset when the two are separated, the two are kept in the same kennel. “The bond between this pit bull and the kitten is just amazing. She cleans it, she licks it, and they snuggle up…they’re doing absolutely well,” veterinarian Rick Hamlin told the The Dodo. These two are up for adoption with one important stipulation: they must be adopted together. To follow up with their story, you can visit the clinic’s page here. If you’re interested in adopting, whether you live in Texas or not, you can always check out your local humane society or shelter.